Introduce Yourself! : Create an “Introductions” discussion in the forum. Then invite new members to introduce themselves by replying to that discussion thread.Â An “Introductions”Â discussion can instantly become a great place to greet new members and find out whoÂ shares your interests. Get Started: Show some ways new members can contribute right off the bat. Promote your most popular features, and give a little guidance aboutÂ the best ways toÂ use them. Link to administrator profile pages: Introduce yourself and the administrators of your social network in the Welcome Center. The ASPCA Online Community links to the profile page of its administrator,Â Elyse.Â From here, new members can leave you a comment on your wall or send you a private message. Provide a “Contact Us” link: Give your members a way to contact you when they need to report an issue or want to know more about you. 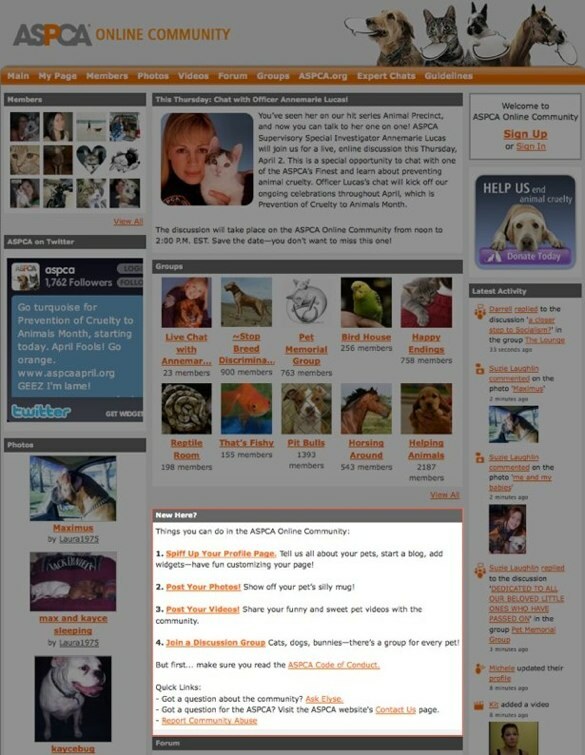 The ASPCA Online Community provides two links â€” one to the contact page of the official ASPCA website, and another to the built-in “Report an Issue” page. This is a great option for people who want to increase the visibility of the “Report an Issue” button in the footer of their social network.